The naughty Mondragó is at it again. He’s bothering all the dragons at the school’s dragon stables and the headmaster gives Cale an ultimatum: if he wants to keep bringing his dragon with him he’ll need to take him to obedience school. 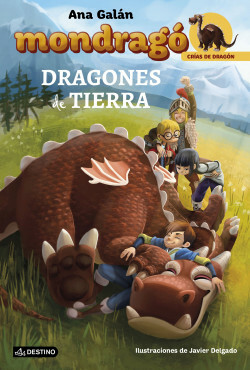 Once there, Antón, the dragon master, asks Cale to help with the incubators for future dragon offspring. The work seems easy until someone...or something...locks him in an incubator oven with the compactiforms and some strange creatures dressed up as plants steal the dragon eggs. URGENT! Cale and his friends need to get them back before it’s too late. Welcome to a world full of flying dragons, castles and moats, danger and courage, good and evil. And the only dragon in the kingdom who can’t fly but who’ll be sure to make you laugh... MONDRAGÓ!